The F-15 Eagle was the US Air Force's first purpose-built dogfighter since the F-86 Sabre. First flown in 1972, the aircraft remains in front-line service with the US Air Force today as well as in Israel, Japan, and Saudi Arabia. When it was first introduced, it's radar featured the first look-down/shoot-down capability tracking multiple targets at the same time. The Eagle is armed with up-to-eight missiles - four AIM-7 Sparrow and four AIM-9 Sidewinders. In later years, the F-15 was modified with new launch rails and avionics to support a combination of AIM-9 Sidewinders and AIM-120 AMRAAM missiles in addition to the AIM-7 (still a total of eight missiles). Great Wall Hobby (GWH) is a kit manufacturer from China that has been producing a number of great subjects overlooked by other manufacturers. 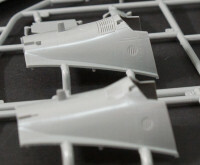 This latest release is an interesting bit of engineering as it renders your choice of F-15B or F-15D out of the box. Given the modularity of this tooling, I'm sure we'll be seeing single-seat Eagles coming in our future. 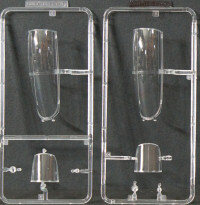 This kit is molded in light gray styrene and presented on 24 parts trees plus one tree of clear parts and one fret of photo-etched parts (not all duplicate parts trees shown). This is one of the nicest Eagle kits I've seen (not counting Revell's 1/48 F-15E) and has lots of possibilities. At the same time, there are some peculiar omissions in the kit that we'll discuss shortly. I think Great Wall Hobby had a different subject for aircraft number four that didn't happen - the Oregon bird is shown in the decal/painting instructions identified as a 65th Aggressor Squadron aircraft from Nellis AFB. That is certainly an aftermarket option! The decals are provided on four sheets and provide one of the most thorough sets of stenciling I've seen for the Eagle straight out of the box. Thanks to Ken Middleton for having me go back and look at the crew names for the OR ANG aircraft. I'll let you look for yourself. 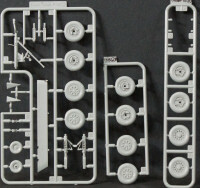 Another note on the instructions, they detail out parts choices based upon 'The Coating 1&2' or 'The Coating 3&4' which really means paint options 1 and 2 (IAF F-15Bs) or paint options 3 and 4 (USAF F-15Ds). With the Escapac ejection seats, you can really do an early block F-15B as they appeared at Luke AFB in the early 1970s (which is where I first saw 73-0113). I believe the Israelis and the USAF refit all of the Escapac Eagles with the ACES when it became available. That's easy enough since you get both types in the box. I don't remember what year the turkey feathers came off the F100 engines of the USAF F-15s but as I recall, that was in the early 1980s. The Israelis kept the turkey feathers on their Eagles much longer and even the new F-15I Ra'am retain their turkey feathers, yet the only option in the box is featherless nozzles. You'll have to raid your old Hasegawa Eagle or go aftermarket. 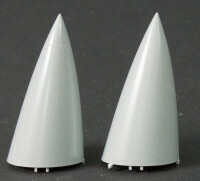 The rear starboard fairing (part J4) is pointed which is correct for an F-15B. If you're wanting to replicate the USAF F-15D option, you need the distinctive ALQ-135 fairing but this isn't in the box. If you're doing an IAF aircraft, you have a great armament selection. If you do the USAF F-15D, you don't. While the Python 3/4s are very nicely done, the IAF also used the AIM-9L Sidewinder, but none are provided. If you're doing the USAF version, you have Sparrows but no Sidewinders. The missile rails for the Pythons appear to be the same as the AIM-9, so you'll need to go aftermarket to get the larger rails that accommodate the AIM-9 and AIM-120 (and get those as well). The latest updates to the IAF F-15Ds feature an interesting datalink dome behind the cockpit. 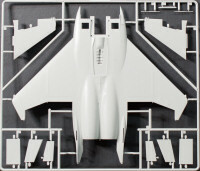 This isn't an oversight on this kit but it would make for an interesting aircraft using all of the rest of the parts in this box plus a little scratchbuilding. Despite the nits above, I really think this is one of nicest Eagle kits I've seen and I look forward to seeing the single-seat versions coming in the future. In the meantime, this kit will also look really nice in one of the JASDF F-15DJ aggressor schemes, or perhaps following through with the scheme this kit was going to have, one of the 65th Aggressor Squadron birds at Nellis. Doing an aggressor not only gives you a colorful subject, is solves the nozzle and armament problems too. Check your references and check six! 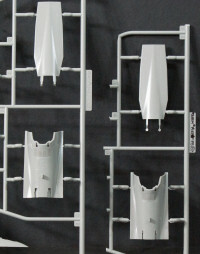 My sincere thanks to Great Wall Hobbies and DML for this review sample! 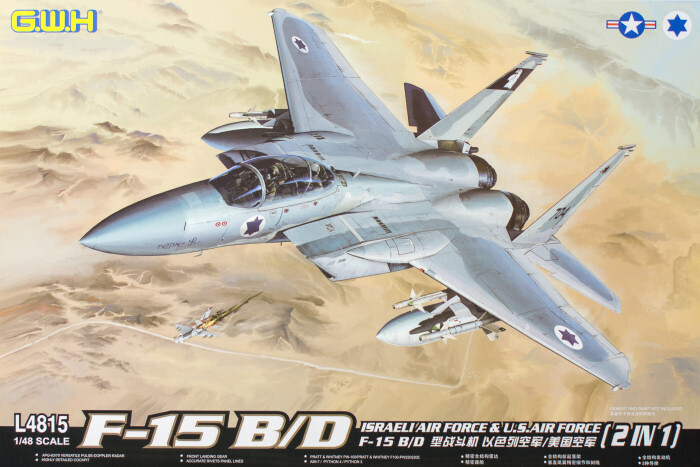 For those of you who've purchased the Great Wall Hobbies 1/48 F-15B/D Eagle kit, I have some good news! After doing the quick-build review of this kit, we identified some interesting quirks though overall I was impressed with the kit (when have you ever seen a perfect kit?). In fact, I purchased another for a future full-build article from Lucky Model. In the meantime, a number of folks came forward with some good information about the F-15B/D after the release of this kit and GWH has produced a correction set. Because I purchased mine from Lucky Model, they sent me the new parts at no charge - from China! 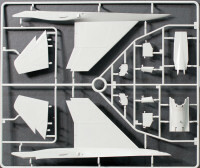 This set is molded in the same light gray styrene and comes on five parts trees (or partial parts trees) plus one tree of clear parts and one radome. Shape of dorsal fairing aft of canopy - the image in the foreground (and out of focus - sorry) is the new fairing. Note how is sweeps up sharper near the canopy. The old fairing (in focus) shows the original shape. The canopy and canopy frame have been revised accordingly. We still don't have the F-15D ALQ-135 fairing and while the kit provides the early Escapac ejection seats, GWH didn't provide feathered exhaust nozzles used when those seats were still installed. These items can be found from other sources while GWH has corrected the shapes of the airframe which the aftermarket would not have touched. Some of these corrections, including the main wheels, speed brake, and radome, will also help to accurize the upcoming F-15A/C kit as well. I want to give kudos and thanks to GWH for producing a correction for this kit (how often does this happen?) and to Lucky Model for continuing their great customer service! Depending on where you purchased your F-15B/D kits, you may also be eligible for upgrades as well. Contact your source for more information.